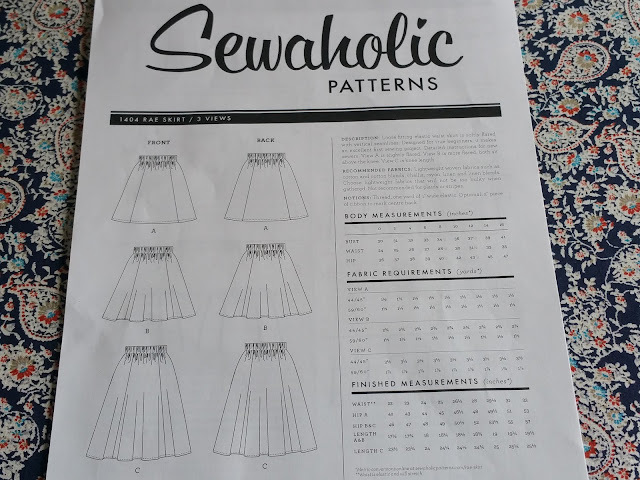 I haven't finished this skirt; and I'm not sure if I can be bothered, but want to write my notes for when I next embark on the Rae Skirt journey. I was interested in this skirt as it has an elastic waist (no zipper = yeah) and the panels mean less bulk around the elasticised waist. 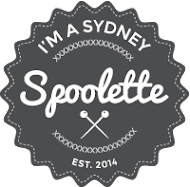 I decided to make up a toile in some floating Rayon bought from my beloved My Hung in Parramatta. The instructions are OK, though I scratched my head a lot as to which panels matched up with each other. In the end I decided that the more flat sides must be the side seams? 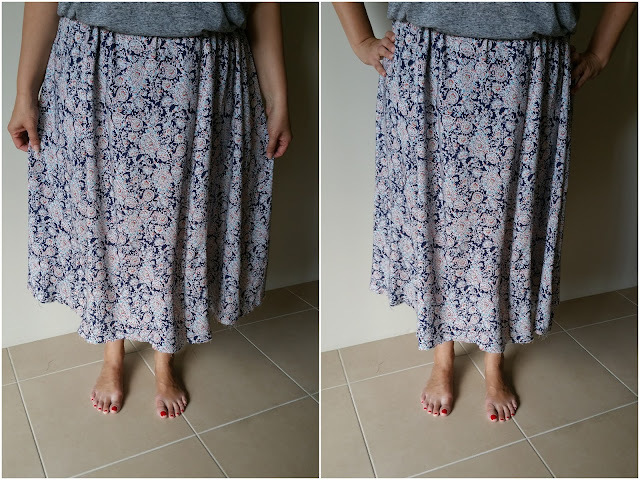 I was hoping to put pockets in to this skirt; but it's just too confusing to figure out where they'd go (sadly, no pockets included in the pattern). The pattern has you make a channel for the elastic which is fiddly and annoying and my elastic twisted TWICE whilst trying to put it in. Next time I'll see it in the round and overlock it straight onto the skirt and then turn it over and stitch it down. I've not been bothered to hem my toile. So whilst I've lost motivation to finish this skirt (cool weather = I've moved on to warmer things) I'm keen to make one next summer out of chambray or tencel. This rayon was very...wiggly, so something a bit more stiff, but not too stiff, next time would be good! Changes for next time: change the way the elastic is sewn onto the skirt.